My name is Christian Schenk. In my "first" life, I studied marketing and graphic design, and worked as a self-employed web designer and graphic artist since 1997. In 2004 a client's trade show project themed "IT's Magic" brought me (back) into magic when I did my first printing of playing cards. I suggested producing an advertising deck that was cut as a Stripper Deck (magicians know what that means) and as I liked the idea also for my own business I produced them for my web design company, too. At the trade show I met a magician who was booked for strolling and he invited me to my first small one-day convention. There the whole story started, I met friends, learned magic as if was a dried out sponge (ball) sucking in all magic that he could get. What seemed to be a new hobby turned out to be the most serious (and fun) part of my whole life. 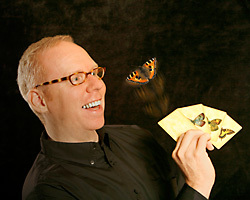 Being a member of world's most prestigious magic societies, I became the #1 specialist for magician's playing cards. Nobody else in the world ever got into the inner core of so many playing card manufacturies than me. Learning all secrets, strengths and weaknesses of so many different manufacturies, I can realize the best solutions for any problem you give to me. "Impossible" is not really in my vocabulary, I love to stretch boundaries and even bring the printers to results they have never seen before. But how did I become the "Card-Shark"? After visiting several manufacturies and testing all cards I can get my hands on I can confirm that the best playing cards available on the market today are those from US Playing Card Company (USPCC). The one deck used by most magicians is the Bicycle 808 ® deck, which most of you will already know. Being a graphic artist, I set my mind on imitating that very playing card design as much as possible, so as to have my self-manufactured gimmicks and cards closely match the original ones. In fact, hardly anyone will be able to imagine the effort I put into this task. For weeks, I literally did nothing else but scan, separate, and re-design playing cards in every excruciating detail - always with the hope that this was going to be a one-time effort and that it would finally pay off. Imitating the most common used brand by magicians worldwide was just the beginning.